Join SPU in reading Prague Winter by Madeleine Albright. I found Madeleine Albright’s latest book fascinating as I read it in preparation for her April visit to Seattle Pacific University. Prague Winter: A Personal Story of Remembrance and War is as interesting and unique as the woman herself. The book was my first glimpse into World War II from the perspective of Czechoslovakia, although I had read about the War from German, Polish, British, and French viewpoints. 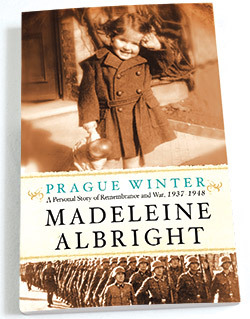 To provide this account of European, and specifically Czech, history, Albright includes detail that was new to me, particularly about the role of the Soviet Union during the War and its aftermath. Albright’s love for America and democracy shines throughout Prague Winter. Having come to the United States with her family in 1948 when her father sought asylum, she knows firsthand what life can be like in places where freedom is not valued. I highly recommend Prague Winter for its window on this period in history, and for its glimpse into Madeleine Albright and all that has shaped her life and contributions to the world. I found her brilliant, articulate, and warm, with a keen interest in exploring the deeper meaning behind words and actions. Marj Johnson retired on June 30 from her position as senior vice president for university relations. One of her many administrative roles over the course of 33 years at SPU has been leading the planning and implementation of strategic events, including the annual Downtown Business Breakfast where Madeleine Albright spoke this year. For more than a decade, Response has invited readers to join with the Seattle Pacific University community in reading a book that is part of the intellectual conversation on campus. This year, our featured book is Prague Winter: A Personal Story of Remembrance and War, 1937–1948 (Harper, 2012) by Madeleine Albright, former U.S. Secretary of State and speaker at SPU’s 2014 Downtown Business Breakfast in early April. Response is offering a limited number of free copies of Prague Winter to interested readers. To request a book, send your name and address to response@spu.edu. You can also find the book at many bookstores or order it online.